As I traveled to DC to risk arrest in an action organized by the National Campaign for Nonviolent Resistance (NCNR) I was feeling nervous, but also knowing this is what I needed to be doing. This would be my first arrest since I was arrested at the CIA in June 2013, and served a one-year probation sentence after an October 2013 trial. Taking almost two years off from risking arrest helped me to really examine what I was doing and why, and I was committed to continuing to live a life in resistance to the crimes of our government. I have been a part of NCNR for 12 years – since the run-up to the war in Iraq in 2003. As the number of people involved in the anti-war movement declines, I know that we must keep up the resistance. Though we don’t have big numbers now, it is more important than ever that we speak the truth about what is happening in the wars in Iraq, Pakistan, and Yemen, in the drone warfare program, and in looking at ways in which the climate crisis is exacerbated by the military. WE MUST TAKE ACTION TO END THIS DESTRUCTION OF OUR ENVIRONMENT BY THE U.S. MILTARY. NCNR began planning an Earth Day action several months ago where we hold the military accountable for their role in the destruction of the planet. I was sending quite a few emails to various individuals and lists as we continued our planning. Then about 6 weeks ago I was contacted by Elliot Grollman from the Department of Homeland Security. He wondered what we were doing, and as a way to try and get more information from me, he asked if he could help facilitate our action on April 22. What was very surprising to me was that he told me he knew about our action by reading my private email correspondence. We cannot ever think that anything we say will not be monitored. He called my home phone number in Mount Horeb, WI at 7:00 am on the morning of the action. Of course I was in Washington, DC and my husband told him that and gave him my cell phone number. On Earth Day, April 22, I joined other activists to deliver a letter to Gina McCarthy, head of the Environmental Protection Agency, calling on the EPA to do their job in monitoring and bringing an end to the military’s complicity in causing climate chaos, and then we went to the Pentagon where we would try to deliver a letter to the Secretary of Defense. Both of these letters were mailed several weeks before the action and we never received a response. In both of these letters we asked for a meeting to discuss our concerns. About thirty people gathered outside the EPA at 10:00 am on the day of the action. 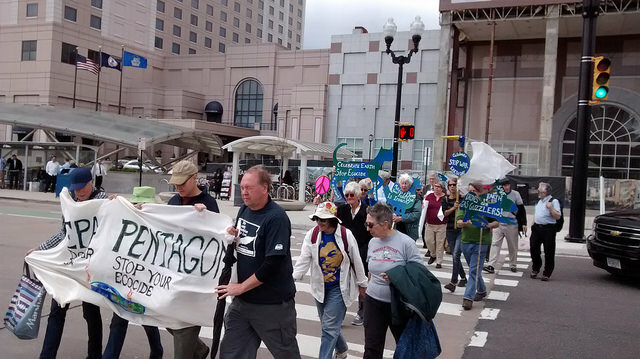 David Barrows made a large banner that read “EPA – Do Your Job; Pentagon – Stop Your Ecocide”. There was a picture of the earth in flames on the banner. We also had 8 smaller posters with quotes from our letter to Ashton Carter. Max started the program and talked about Mother Earth weeping as she was being destroyed by her children. Beth Adams read a statement, followed by Ed Kinane reading a statement by environmentalist Pat Hynes. We had the letter we wanted to deliver to the head of the EPA, Gina McCarthy, or to a representative in a policy-making position. Instead the EPA sent someone from their Public Relations office out to receive our letter. They said they would get back to us, and I will be surprised if they do. Marsha Coleman-Adebayo then spoke. Marsha had been an employee of the EPA until she blew the whistle on activities they were part of that were killing people. When she spoke up they told her to keep silent. But Marsha talked about how she would see people like us outside the window protesting against the EPA. Those protestors gave her courage to continue to push for an end to the crimes being committed by the EPA, even though she was fired. Marsha told us that by us being outside the EPA, we were offering inspiration to people who wanted to speak up, but were feeling scared to do so. We had more work to do and so we left the EPA and took the Metro to the Pentagon City mall food court where we had a final briefing before heading over to the Pentagon. We had about fifty people processing to the Pentagon with people holding puppets made by Sue Frankel-Streit taking the lead. As we approached the Pentagon I could feel the butterflies in my stomach and my legs were feeling like they were turning to jelly. But I was with a group of people who I knew and trusted and I knew that I needed to be a part of this action. We entered the Pentagon reservation and walked on the sidewalk towards the Pentagon. At least 30 officers waiting for us. There was a metal fence along the sidewalk with a small opening that we were ushered through onto a grassy area. This area on the other side of the fence was designated as the “free speech zone”.